If Michael O'Neill's team beats Hungary and clinches Euro 2016 qualification on Monday, 7 September will go down in Northern Ireland football history - but not for the first time. That is because the Group F qualifier is being played on the 10th anniversary of the famous 1-0 win over Sven-Göran Eriksson's England. It was a remarkable and unexpected triumph for the boys in green, managed by Lawrie Sanchez. They had frustrated David Beckham's side for 72 minutes in a World Cup qualifier, and then David Healy struck the goal which cemented his place in NI football folklore. To celebrate the anniversary, BBC Sport invited four players from that team - Aaron Hughes, David Healy, Steven Davis and Maik Taylor - to a night out at the cinema. 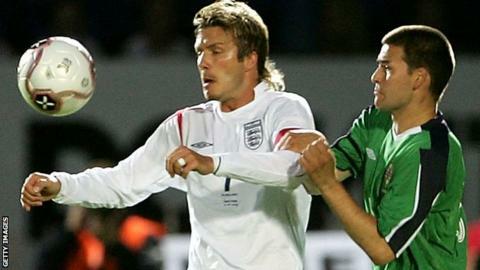 Not to watch a new release, but to view a classic - Northern Ireland 1 England 0, 7 September, 2005. Goalkeeper Maik Taylor: "No-one expected us to get a result but we quietly felt we could produce something." Captain Aaron Hughes: "There are parts of it still quite fresh in my mind but that is probably because of the significance of the game and what happened. The quality of the side we were playing against makes the result even better. The pass from Steven Davis: I just tried to judge it in the air. David got back onside, made a great run, and the rest is history. Scorer David Healy: As a striker you make five or six runs and don't get the ball. But with a player like Steve you know if you make the run and stay onside, he was one who could pick you out. "I didn't know I was onside until I turned around. Then you just try to hit the target and thankfully it went in." David Healy: "After the game I got David Beckham's shirt and he signed it "best wishes, great result, well done". Aaron Hughes: The final whistle is the thing which sticks in my head the most, because it was a different type of cheer, almost like a shriek of excitement. It was just a totally different experience. "It was different to the end of any other international game I have played in. The noise of the crowd is something which will stick with me forever." "It is hard to believe it is that long ago. There are parts of it still quite fresh in my mind but that is probably because of the significance of the game and what happened." Steven Davis: "The match is a bit of a blur to me, it was quite early in my international career. But it is something I look back on with great pride."